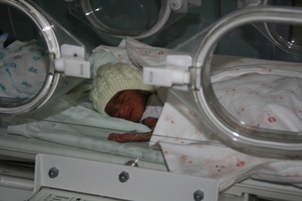 Senehasa has provided 6 incubators, respiratory equipment and a portable incubator following the destruction of the neo-natal unit at the Mahamodera Hospital. This project cost over £35,000. All six were in use straightaway. The neo-natal ward was set up temporarily in one of the only parts of the hospital still used extensively by patients. Senehasa has also provided the neo-natal ward with essential equipment such as baby stethoscopes, emergency lamps and torches, and nasal prongs to supply oxygen without using masks. These are not expensive items but each has significantly improve the standard of care given to these very sick babies. Senahasa has also supplied piped oxygen, syringe and infusion pumps to provide accurate dosage for prem babies and a centrifuge for blood analysis. These will also have a significant impact on the quality of care for these premature babies. Due to the proximity to the sea, the delicate equipment in the neo-natal ward is being damaged by salt deposits and require constant maintenance. Consequently, Senehasa sealed the unit and installed air-conditioning. Other facilities have been improved including providing the ward with a dedicated areas to wash nappies and sheets and clean equipment. Previously they were all washed and dried in the same sink in an open corridor. And most recently a new ceiling has been added to an adjacent ward. We have also provided clothes, bonnets, and blankets for the tiny babies. Dulcie, the tailor we helped, made the clothes; Prilly Crowther, Olga Gibb and others knitted the bonnets and blankets in the UK. Without these gifts, many families would have nothing to dress their babies in when they finally take them home. Senehasa was also asked to build a ‘Mother and Baby Unit’, for premature babies and their mothers, once they no longer need critical care in the neo-natal ward but were not ready to go home. The Mother and Baby Unit was completed in 2015. Between 2014 and 2017, Senehasa has also refurbished the neo-natal ward at Karapitiya Hospital in the Galle District. Equipment such as neo-puff machines, CPAP machines, high frequency oscillating ventilators and an ultrasound machine have also been donated. In 2019, Senehasa provided a critical care patient transfer bag for the ward.